Room 13 Hareclive will be having an exhibition in the LIGHT STUDIO at ARNOLFINI Gallery, Bristol. Timed to coincide with their Patron Richard Long’s show, Room 13 Hareclive’s exhibition: Adventures of Curiosity and Wonder: the Dundry Slopes, Bristol’s hidden treasure in Hartcliffe is open Tuesday 3rd – Sunday 8th November, 11am – 6pm. Inspired by the work of Richard Long, a group of Room 13 children, young people and adult artists have been exploring this beautiful but under-used green area on the edge of south Bristol. Through clambering, climbing and walking, talking to people, looking at books and listening to stories and memories, their aim was to re-discover new meaning in a landscape that nobody has named, and to encourage new ways of seeing and using the Slopes for all. This exhibition documents their collective journey of discovery so far. Poetic yet functional maps will be printed for public use in December. Room 13 Hareclive say it like it really is! 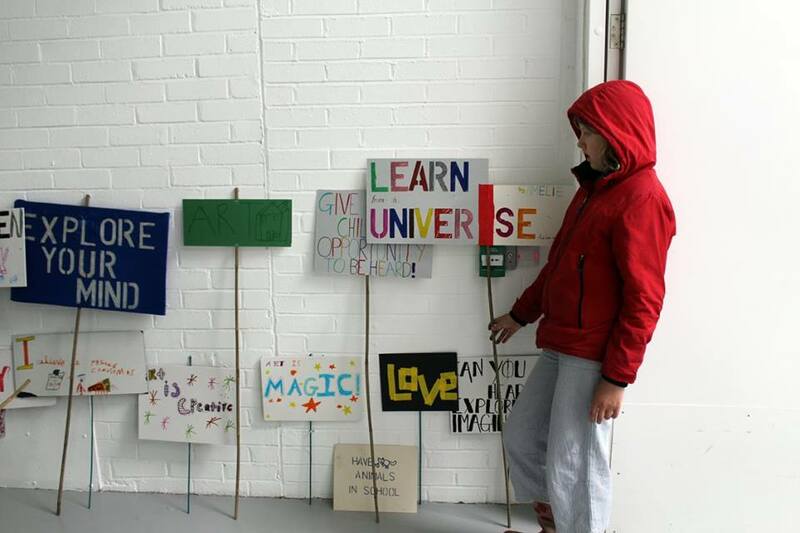 Room 13 Hareclive welcomed members of the public along to their 3rd Open Studio event at Spike Island! They invited visitors to join them in making messages from the heart – creating banners and signs as part of a participatory piece ‘ Say it like it really is’ – inspired by the lead up to the UK general elections. They had a slot at Speakers Corner where they asked and discussed questions put to Room 13ers by a group of Ukranian students. 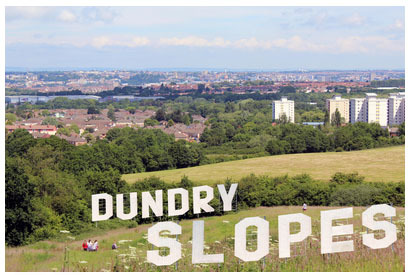 They also took the opportunity to get underway with their #NAP2015 Bristol 2015 European Green Capital commission, asking the public: What do you know about Dundry Slopes? Following on from this, a panel from Room 13 Hareclive interviewed landscape artist Richard Long at Arnolfini Gallery in Bristol – a symbolic and inspiring start to their project on Dundry slopes! More photos of these events on Room 13 International facebook page. Room 13 Hareclive has been awarded a Bristol 2015 European Green Capital commission (Neighbourhood Arts Project). Inspired by Bristol artist of walking and place Richard Long, and building on previous socially engaged arts practice in the community, Room 13 Hareclive will deliver a collaborative exploration and re-imagining of Dundry Slopes, where the interests, questions, wonder, curiosity, imagination and pioneering spirit of local children will lead the way. Through dialogue with local people and organisations that know and use the Slopes, and through discovering nature and our own physical and visual responses to the area, Room 13 Hareclive will produce 3 functional yet poetic discovery maps that we will print as one beautiful fold-out map. They will also choose one of the maps to reproduce as a bronze plaque to go on the Slopes themselves. The work will be exhibited and publicised locally and in Bristol via several key exhibitions. Together, the maps and work will open up new ways of seeing and interacting with the Slopes for all ages. **Room 13 Hareclive will once again be participating in Spike Island Open Studios event from Friday 1st May to Monday 4th May. 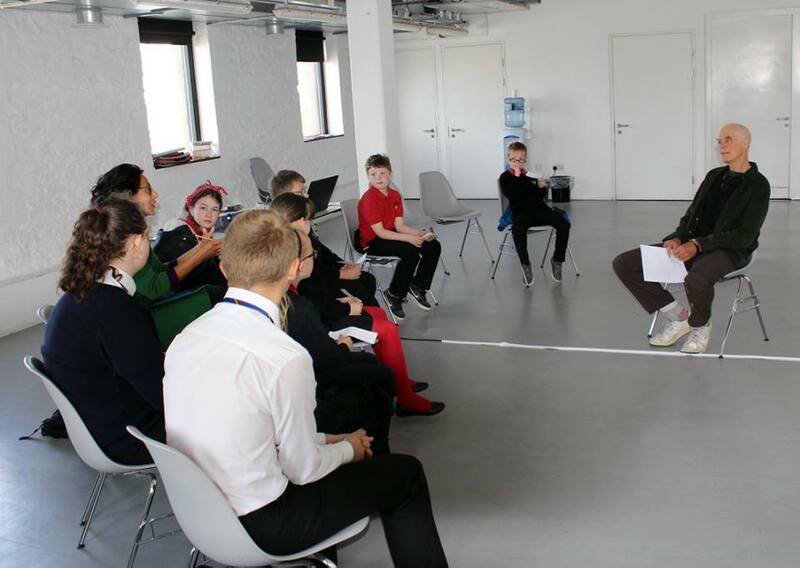 An exciting new exhibition by the artists of Room 13 Hareclive will feature in Spike Island Open Studios this weekend 4th, 5th and of 6th May, Studios are open 11am – 5pm. Room 13 Hareclive have won a place on the resident thinkers programme nowhere island.